Whether you find global warming as an ethereal notion only worthy of banter or, like many scientists, a real phenomenon to be studied, the effects pose difficulty for practitioners to forecast the behavior of commodities like electricity and energy. 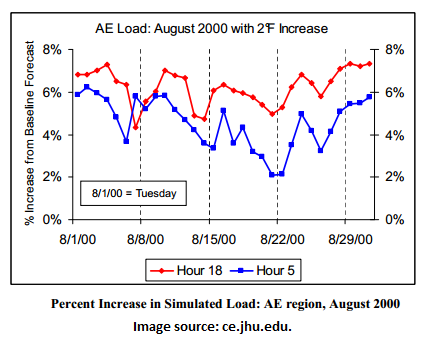 I’ve discussed some methods for forecasting electricity price and crude oil price in prior blogs, but the influential effects from climate change were lightly touched. It’s a good time to discuss these effects in predicting demand, a metric I feel is generally more important to forecast than price. Economists at the California Energy Commission (CEC) periodically publish reports on forecasting the demand for electricity and natural gas. Other states do this too, but we’ll focus on California. 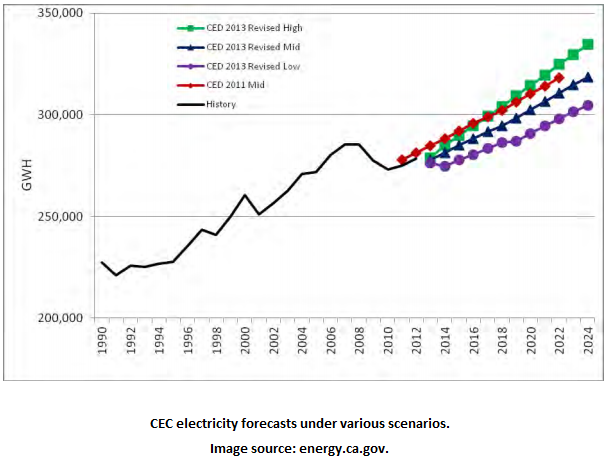 In a 2013 report, the CEC mentions their iterative approach to forecasting electricity demand for the residential, commercial, industrial, agriculture, transportation, communication, and utilities sectors. They included climate change impacts into their forecasts by incorporating temperature scenarios provided by the Scripps Institute of Oceanography. 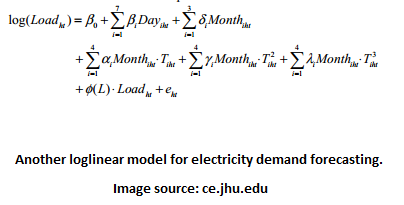 Additionally, economic growth, electricity and gas rates, and efficiency programs are used to create low, mid, and high demand scenarios for forecasting. The report illustrates one of their forecasting results below. Day and Month are indicator variables (also called dummy variables and have a value of 0 or 1), ht refers to hour and day, and T is temperature. The astonishing model fit results peak my amazement, though experience suggests keeping a cautious eye. 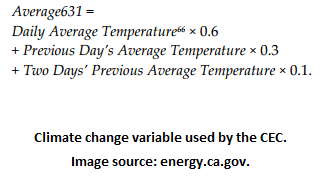 Now, it’s kind of tough to do a controlled test of an entire geographic region wherein you measure electricity demand at temperature X and then go back in time and measure again at temperature X + 2 degrees Fahrenheit. It’s also tough to do the test by randomly assigning a bunch of people so that specific people get a certain temperature ambiance. For example, you get a temperature of X degrees and your neighbor gets a higher temperature. So, the multiple testing approaches I discussed in a prior blog go out the window. Catch my drift? In lieu of these shortcomings, we can run a simulation to estimate the impact of climate change. The GWU economists reveal that a 2 degree Fahrenheit increase in temperature would yield a 5.4% increase in electricity demand. They illustrate a simulation result below. The researchers estimated climate change impact in other regions and found a 4.5% increase in electricity demand. This entire data exploration and analysis can be tricky to do nicely. From data gymnastics, model fitting, to simulation running, you can do all this in Lumina Decision System’s Analytica platform. What other commodities, services, or products do you think have demands that are significantly influenced by climate change? Urban planners design city features that consider weather patterns. Civil and chemical engineers design roads and asphalt mix to withstand regional climate conditions. What parts of the world need better forecasting when considering climate change?